Perelandra Zip Bag - Perelandra Ltd. The bag is 9" long by 6" tall, with a handle. It's made of soft, durable 10-oz. unbleached cotton. And, it's manufactured by a family- and woman-owned environmentally friendly company in the U.S. 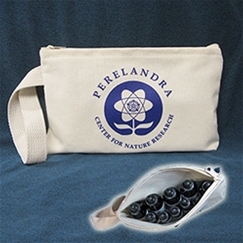 It also makes a splendid, ecological gift wrap, especially if you are giving healthful bottles from Perelandra.